Hi, everyone and welcome to Tag Week! 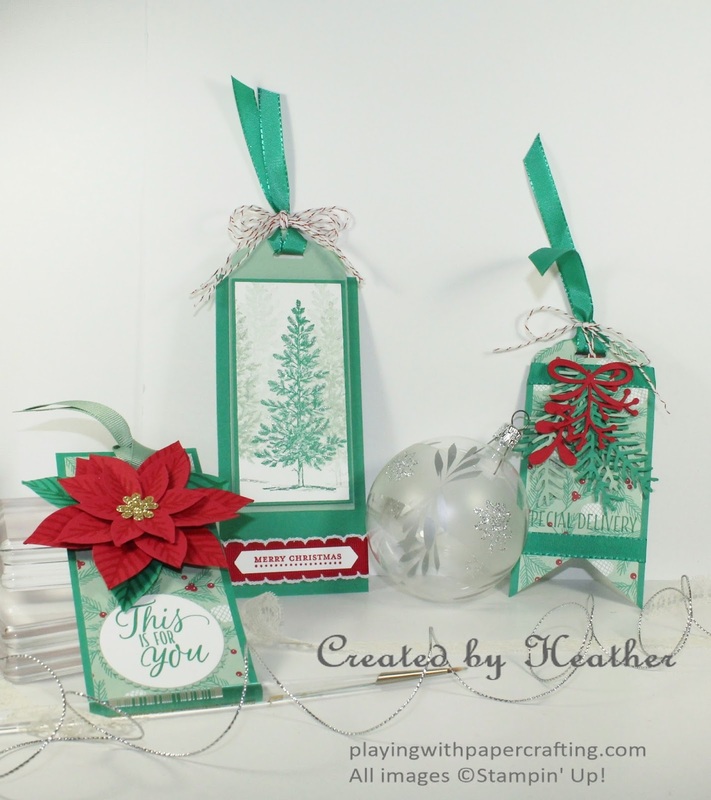 This week I'm featuring tags of all kinds and designs guaranteed to add a beautiful custom touch to all your packages under the tree this Christmas! I want to show you how all sorts of your stamp sets, punches and dies can be used to create them as well. 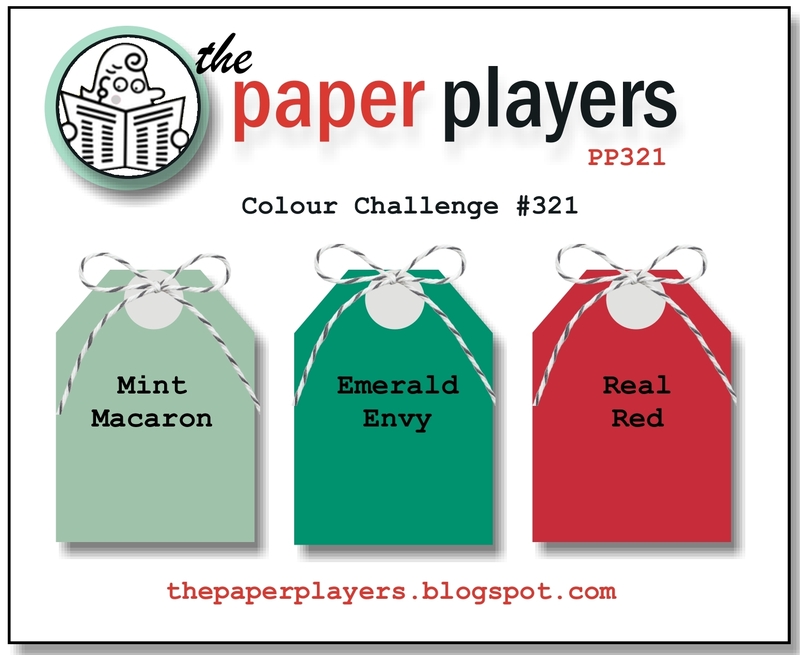 Today, in honour of The Paper Players challenge for this week, I'm using a palette of Emerald Envy, Mint Macaron and Real Red. I think you'll agree that it creates a really festive look! Which old favourites do you spot here? 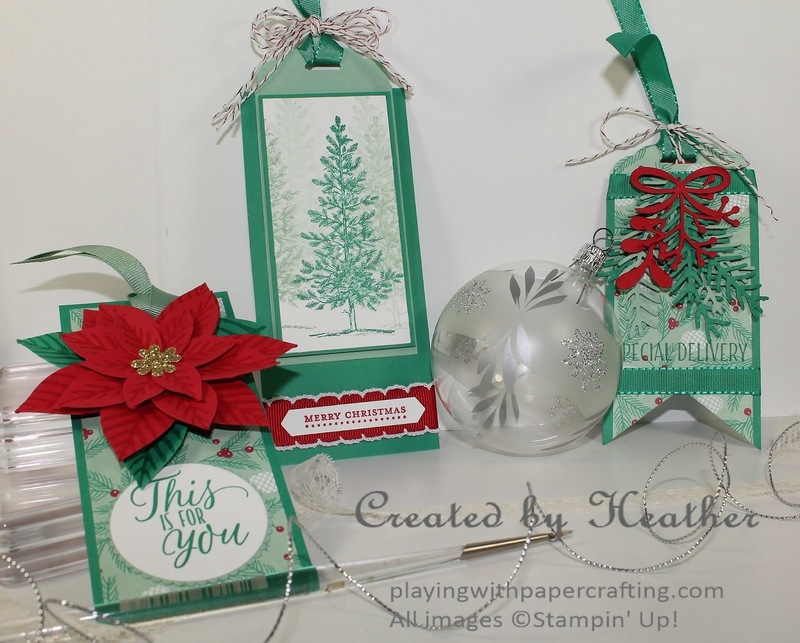 Did you say Lovely As A Tree, Reason for the Season, Teeny Tiny Wishes, Festive Flower Builder Punch and Scallop Tag Topper Punch? If you did, you're right! Also the Banners Framelit Dies! This tag features the evergreen in Lovely as a Tree stamped in Emerald Envy, then in Mint Macaron full strength and continuing to stamp a couple more times in the background without reinking to create distance. I added a little two way glue on the branches and some Dazzling Diamonds fine glitter to the glue to make the branches sparkle with frost or snow. 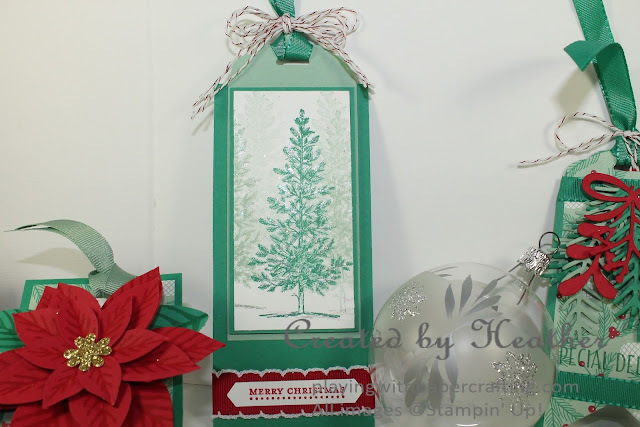 I wanted it to be a larger tag, so I mounted the tree on Emerald Envy and then on to a 2" wide piece of Mint Macaron which I was able to punch using the scallop tag topper punch, since it's what fits in the punch. But then I mounted that onto a larger piece of Emerald Envy so I would have room for a sentiment and ribbons. The sentiment is from an old favourite, Teeny Tiny Wishes. I punched it out using the Classic Label Punch at mounted it right on the 3/4" Stitched Edge Ribbon, which provides a great backing. I used Fast Fuse adhesive to do that. For a smaller tag, I die cut several fir boughs from the Pretty Pines Thinlits along with some mistletoe and berries and a ribbon and built a swag right on the tag. The sentiment is from Tin of Tags stamp set. I love the Emerald Envy 3/8" Silky Taffeta Ribbon from the Combo Pack used for trim here. A little Candy Cane Lane Baker's Twine adds a finishing touch. 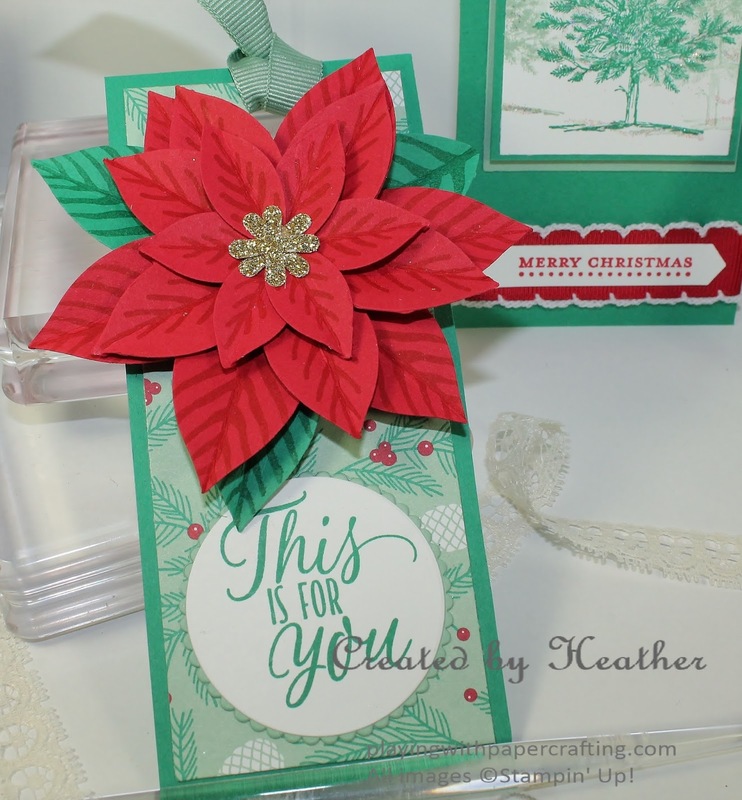 A final tag uses the Reason for the Season stamp set to stamp the petals and leaves of the poinsettia and the Festive Flower Builder Punch to punch out the pieces to make a poinsettia in Real Red and Emerald Envy. The sentiment is from Tin of Tags stamp set and is die cut, along with its scallop backing using the Layering Circles Framelits. The opening in the top of the tag is die cut by a die taken from the Baker's Box Thinlits Dies. 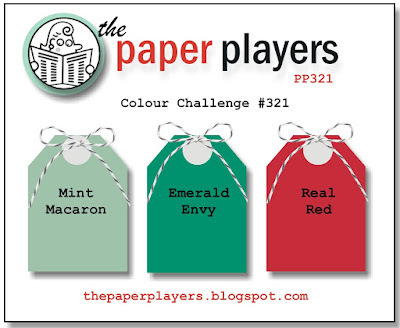 The ribbon is Mint Macaron from the 3/8" Ribbon Trio Pack in the Holiday Catalogue.